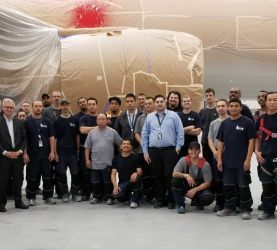 In November 2018, Satys SP USA completed painting its 100th Boeing airplane. This milestone occurred 24 months following the award of the Boeing contract for paint services at PDX (Portland), fulfilling fulfilling the dream of many colleagues of Satys to take OEM painting and sealing services to America. Following a rapid mobilization and start-up, Satys SP USA (then STTS USA) completed its first airplane an EVA B777 in March, 2017. Since that time the Satys SP USA team with Group production and management support has painted 4 different Boeing aircraft, B737, B747, B777, and B787. There have been over 45 different liveries, in both passenger and freighter models. In July, 2018 the team began a process that allows side by side painting of B737 in one hangar with a wide-body aircraft in the other hangar. While there have been challenges along the way, the commitment to safety, on-quality and on-time delivery has never waned. The Satys SP USA team continues to grow its skill level, granting nearly 100 promotions as individuals progress through the Satys training program. In addition, we have achieved several consecutive “clean” Boeing site audits and Satys Managers frequently participate in trainings and meeting in order to share best practices with other Satys sites and colleagues around the world. To mark the 100th airplane milestone, the Satys SP USA Team gathered in front of the aircraft for a photo with our visiting CEO, Christophe Cador and then enjoyed 100 cupcakes & 100 glasses of sparkling cider. Bravo! On October 1st Satys acquired the company Air Livery one of Europe’s leaders in the aircraft repainting business for more than 25 years. The Air Livery headquarters are located at the Norwich Airport and it operates eight hangars on five sites in the United Kingdom (Norwich, Manchester, East Midlands, Cambridge and Southend) as well as one in Bratislava, Slovakia. The company paints over 200, long and short-hauI aircraft as well as corporate jets per year. It forecasts a turnover of £17m for 2018/19 and has 170 employees. This acquisition will allow Satys to consolidate its repainting activity (“aftermarket”) and complement the current network: Paris - Le Bourget, Lelystad, Casablanca, Haikou (China) and Dubai (opening scheduled end 2019). Operations will be supplemented with a long-range hangar in Europe in 2019. This acquisition offers new possibilities as Air Livery has expertise in support and engineering (Part 145), graphics, external markings and sticker production. 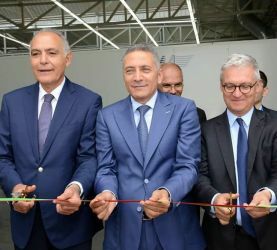 Under the honorary chairmanship of the Minister of Industry, Investment, Trade and Digital Economy Moulay Hafid Elalamy, Satys inaugurated, on Wednesday, July 4th, its new plant in Casablanca. It is dedicated to sealing and sub-assembly painting. The new facilities has required an investment of about 2 million Euros and will create 50 job opportunities in the future. 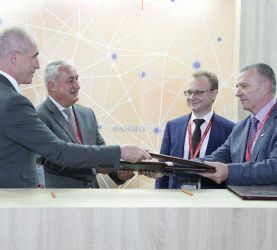 As part of its development strategy, Satys signed a partnership agreement at the Saint-Petersburg Economic Forum with the company Spektr-Avia, a Russian specialist in aircraft painting, the Ulyanosk regional government and the Regional Development Corporation. This partnership will enable the construction of a Single Aisle paint shop in Ulyanovsk. Design has already started and the company will be set up before the end of the year. The first planes should be rolling out of this new paint shop in 2020. STTS contracts ASI to build its state-of-the-art aircraft painting hangar at Dubai South. 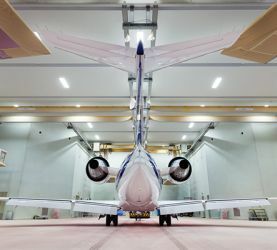 In order to respond to the growing needs of the aerospace industry in terms of painting facilities and to offer customers in the Middle East greater proximity, STTS has appointed Aircraft Support Industries (ASI) to take on the building works of its wide body painting bay at the new Al Maktoum International airport. Environmentally friendly through regulated waste management and air emissions in conformity with the highest standards. Christophe Cador, President of STTS said, «I am proud of this facility launch and its level of quality. I am confident that ASI will do its utmost to meet our expectations and enable us to soon deliver painting services of the highest standards to operators in the region». Tahnoon Saif, VP of Aviation at Dubai South said: «The new STTS facility adds to the aviation and aerospace industries and contribute in positioning the Aviation District to a global aerospace hub». Saif Adds: «We are excited to see our partners progressing in their projects and look forward to supporting them to serve regional and global markets».